Just like the Yagi antennas, the vertical by Ultrabeam work with a radiator of variable length. Only that the radiator is pushed up vertically instead of horizontally. To make that work against gravity, the vertical has a smaller additional tubing inside the larger, outer glass fibre tubes. This assures the copper tape to run smoothly. The motor drive is the same as with the beam antennas, the controller is the RCU-06 with a special firmware for vertical antennas. The lower end of the motor unit has a reinforced mount which is installed on a vertical tube, either on the roof or at ground level. A 100cm long aluminium tube with 50mm diameter is supplied, the maximum diamter is 50mm. The UB-V40 vertical has a height of approx. 11m, sufficient to house a λ/4 radiator from 6 to 40m. In conjunction with a suitable radial system you will have a very efficient and perfectly matched vertical antenna. Due to the very low take off angle this antenna is very well suited for DX work. The UB-V40 requires a 4 wire control cable. The antenna should be guyed in any case, a guying clamp is supplied, but further material like guy ropes, clamps and thimbles not is not supplied. To connect the radials the motor unit has metal rail which can take several radial wires. 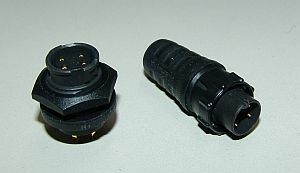 The coaxial connect is PL type (SO 239). The weight of the antenna is approx. 8.1 kg. Supplied with each Ultrabeam antenna is the RCU-06 controller, wihch allows easy operation of the antenna. A large, colour touch dispaly serves as main onput element for all settings. In normal configuration you select the operating band with one press, and then can move the antenna in fixed steps up and down in frequency. Much more comfortable though is the operation with a CAT interface to the transceiver. With such a data connection the antenna can follow the transceiver all the time. To include other existing devices like an amplifier the controller has a CAT output as well, which feeds the transceiver information to other connected devices. The RCU-06 has a USB interface for PC connections. We offer a software for this controller which allows full control of the antenna from the computer, in parallel to the controller. This is not only important for remote controlled stations, but offers more convenience also for the single operator. This PC software allows to adjust the various settings, for example to adjust the antenna model to the local conditions (height above ground, soil conductivity and so on). The precise adjustment for local factors leads to a better efficiency and higher performance of the antenna. The RCU-06 controller is also available separately, for example to retrofit an older antenna. Please note that the pin assignment on the connector has changed between the old controlelr and the RCU-06. If required we can offer an adaptor. For some transceiver brans we offer a CAT cable. With the beam antennas which have elements with different length (3-Elem. 6-40m and 4-Elem. 6-40m) and with the UB-50 beam, the driven element (the radiator) is switched when operatinf on 30 and 40m. This makes these antennas work as 1-, 2- or 3-element fullsize beams on 30/40m, as well as 2-, 3- or 4-element fullsize on 6 to 20m. The switching relay is included in the shipment and is selected automatically by the controller, depending on operating frequency. The UB-20MX Ultra Beam is even smaller than the UB-40MX and is already working from 15m as a Moxon 2 element beam. This antenna can be operated up to 20m. At only 2.9 m boom length and 7 m length of this beam element fits on each house. This new antenna model operates in the following configurations : Three-element full-size yagi on the 10-12-15-17-20 and 30 meter bands; Two-element full-size moxon on the 40 meter band. The new UB-40 MX is the first dynamic antenna system adopting the "Moxon" system. It is the only possible solution to dimension-reduction without performance-loss. Despite a dimension reduction of 30% , the UB-40 MX still shows very similar performances as a common two-element full-size yagi for the 40 meter-band. There is no other Yagi design capable of reducing the dimensions of the UB-40 MX any further without inevitable losses in terms of forward gain and F/B ratio. The UB-40 MX has been especially dedicated to those Hams who have always dreamed of a dynamic antenna operating with at least two elements on the 40 meter-band, but with reduced dimensions than those of the bigger full-size "sisters" which, space restrictions, very often do not permit to install. A special antenna model is the Ultrabeam UB-50, a compact beam which covers 7 to 50MHz. This antenna works as a 3-element fullsize beam on 6 to 20m. From 30m on the two front elements are completely retracted, only the rear element is used as a rotary dipole. To accommodate the required length of the radiator, the CuBe tape is bent by 90° at the end of the tubes and is directed in parallel to the boom. This results in a good SWR and a high efficiency, nearly the same as with a normal dipole radiator. Yet the rotating radius of this antenna is only 5.6m! The element support plates are constructed to support the additional weight of the outer tubes. The UB-50 can be extended with an optional 6m passive element (1220.63). As 3-element beam (without the 6m option) the UB-50 has a gain of approx. 6dB on 6m, and a front/back ratio of 18dB. With the optional, passive 6m element the UB-50 reaches 8.2dB gain on 6m, at a F/B ratio of approx. 20dB. Finally QRV on 30 and 40m! A small 2 element fullsize beam for the bands from 6 to 20m, and a fullsize rotary dipole on 30 and 40m! And all that without causing too much distress for the neighbours... Ultrabeam changed the matching circuit for the driven element to achieve always a perfect 50 Ω match. This results in a high efficiency also on the 30 and 40m band. On the bands 6 to 20m this yagi achieves the same excellent results as the classic 2 element Ultrabeam. Like the other 'large' Ultrabeam antennas, the UB-2-40 uses a square boom for high stability. And it uses the same super massive boom plates for the motor units and the elements, resulting in a superb mechanical stability. Like with all Ultrabeam antennas the controller is included. The control cable must be ordered separately, reference number 1224?. Please note that the cable article 12240.2 cannot be used with this antenna. Other cable lengths on request. The antennas have a square boom. This fixes the elements always horizontally on the boom, even after a storm. The newly developed VRS Variable Reeling System makes sure that the retracting force for the CuBe tape is always constant, independent of of the position of the elements. All mounting hardware (except boom reinforcements) are made from stainless stell or aluminium and have metric sizes. The controller have discrete transistor drivers for the stepper motors. These drivers can handle up to 10A current and are short-circuit proof and protected against errors in wiring. Software updates for the controller are available free of cost via Internet. The controller has a large matrix LC display with menu oriented use. A serial CAT interface is installed with every controller. The control wires are connected with water protected connectors to the EHUs. No more simple terminal strips. Ready made control cables are available as an option (state required length, 30m is standard). Just plug into the antenna, into the controller - and go! Direct interface with many microHAM devices: microKEYER-II, MK2R/MK2R+ and Station Master. See below for details. Manufacturers warranty is 4 years. Balun - - - incl. incl. incl. incl. incl. incl. incl. incl. incl. incl. incl. **UB-50 max. 1500 Watt on 30 and 40m! Control Cable 30m - other lengths on request. All Ultrabeam Beam antennas are supplied including controller. The control cable needs to be ordered separately, standard length is 30m, other lengths on request. The Ultrabeam Verticals are supplied without control cable, the required connectors are included. You will need a 4 wire cable. Protects the antenna while elements are moving (retuning). Transmission can not be initiated using PTT while the antenna is retuning. When using VOX or PTT over CAT, interface will not activate PAPTT to prevent a power amplifier from operating when Ultra Beam is tuning. When operating in split frequency mode, the transmit frequency is sent to the UltraBeam to prevent retuning between transmit and receive when operating with wide splits. A PS/2 keypad attached to interface permits suspending/resuming Antenna control, selecting 180° mode and/or selecting bidirectional mode. Using the keypad allows manual control while keeping interface and Antenna controller in sync.